Ground-borne vibration consists of oscillatory waves that propagate from the source through the ground to adjacent buildings. 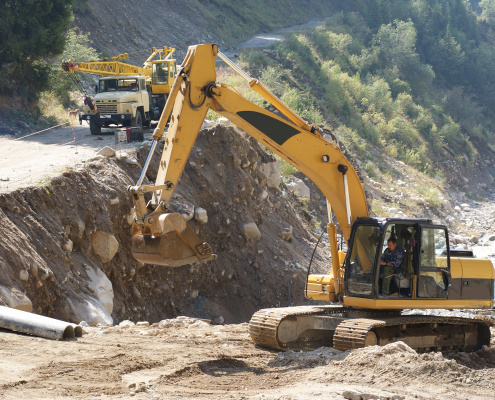 Vibration from construction projects can sometimes lead to complaint and is usually at its highest during pile driving, soil compacting, certain demolition activities. Moloney & Associates Acoustic & Environmental Consultants undertake ground-borne vibration assessments and normally this is associated with construction work. Human beings are known to be very sensitive to vibration, the threshold of perception being typically in the PPV (peak particle velocity) range of 0.15 – 0.3 mm/s, at frequencies between 8 Hz and 80 Hz for continuous vibrations, and 0.5 – 1.5 mm/s in the case of impulsive vibrations from blasting operations. It is rare that vibration is noticeable outdoors and in most cases the perception of vibration arises inside a building. Although it is conceivable for ground-borne vibration from construction projects to cause building damage, the vibration from construction activities is almost never of sufficient amplitude to cause even minor cosmetic damage to buildings. The primary concern is that the vibration can be intrusive and annoying to building occupants. In the real world construction vibrations consists of a composite or “spectrum” of many frequencies and are generally classified as broadband or random vibrations. The normal frequency range of most ground-borne vibration that can be felt by humans generally starts from a low frequency of less than 1 Hz to a high of about 200 Hz. Vibration levels are usually expressed as single-number measure of vibration magnitude, in terms of velocity (typically peak particle velocity) or acceleration, which describes the severity or amplitude of the vibration. Vibration damage assessment is normally undertaken using a triaxial accelerometer to measure the vibration in three directions with the convention being for X-direction towards the source, Y-direction at right-angles and Z-direction in the vertical plane. The latter is normally the greatest level measured since any energy is coming up through the ground. The parameter to be measured is Peak Particle Velocity (PPV) in mm/s. According to BS:7385.1993 Evaluation and Measurement of Vibration in Buildings this parameter has been found to be the best single descriptor for correlating with case history data on the occurrence of vibration induced damage. The levels measured can be compared with the limit levels suggested in BS: 7385.1993.